I am not too much of an eye shadow user. The whole blending and proper application seems time consuming for me when I am rushed. But when I chanced upon the Streetwear Stay On Mineral Eyeshadow, the packaging caught my eye. It comes in a liquid eye liner kind of container which seemed to be the most natural way of applying eye shadow to me. So I picked up a shade in a dark brown, called Royalty, to play safe. There are other shades in blue and green-yellow too in the same range. For a 2 gm pack, it is priced at Rs.275. It comes in a nail enamel/ liquid eyeliner kind of packaging with a doe tip applicator. The packaging claims that it is a long wear mineral eye shadow with good for skin minerals. They claim that it is non-irritating, blend able and smooth and won’t smudge or crease. While the packaging was the factor that lead to the purchase, I realized on using it that the design is not very efficient. 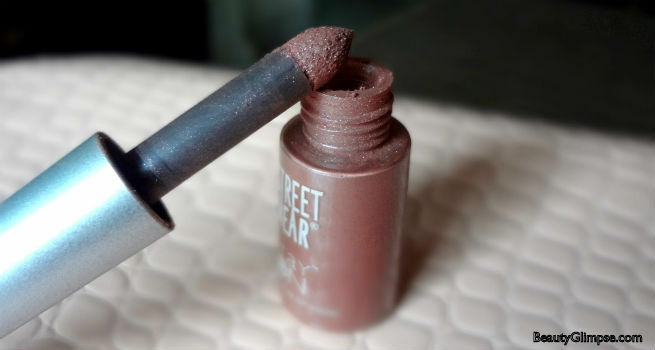 The eye shadow is a shimmery powder inside the tube and a lot of the product goes waste while opening and closing the tube if you are not careful. But once you have carefully opened it, it is a easy task to apply the eye shadow. You can finish it off in one stroke, to go over your eye liner or blend it in for more color and pigmentation. It blends well and easily and a couple of strokes gave me a nice dark brown color. A single stroke is enough for a regular day, since it has just the right amount of shimmer to open up your eyes. The shade Royalty is neutral and is great for daily use. The picture shows you three swatches in sunlight- the first one a single stroke, the second being two strokes of the eye shadow and the third is what it looks like when it is blended well. I used it directly on the lids and found that it more or less matched my skin tone and only seemed like I had put on some shimmer on top. So from the next time, I have been using it after applying some concealer on my lids. That nicely brings out the color of the eye shadow and highlights my eyes well. About its claim of being “stay on”, well, it stays for 2-3 hours if you do not tamper with your eyes. But if you are the kind that rubs the eyes, then it will surely wipe off sooner. Any time you touch your eyes, you will find some of the product deposited on your fingers. But the product makes for a good buy for a first time eye shadow user, since it is not too pricey and you can use it easily with the applicator. Not just as an eye shadow, you can also use it easily to line your eyes in a thin shimmering line. It does not need a make up remover to remove it. You can actually simply wipe it off with a tissue, it is that less pigmented. Else, it washes off when you wash your face. Overall, Streetwear Stay On Mineral Eyeshadow is an average product at a good price. If you are the kind who is starting off with eye shadows and are not too sure if you will use it regularly, then this would be a good product to start with. Doesn’t last longer than 3-4 hours. There can be product wastage while opening and closing the cap.